Please note that, as an insurance company, LAWPRO does not provide tax advice. The answers provided below represent our understanding of the application of the various tax laws. However, we encourage you to consult your tax adviser about the application of these tax laws. When did the HST come into effect in Ontario? The Harmonized Sales Tax (HST) formally came into effect in Ontario on July 1, 2010. Note that some transitional rules were enacted and some of them took effect before the July 1, 2010 implementation date. The Ontario Ministry of Finance published an Information Notice to help businesses and individuals with these special rules. Are goods and services subject to the same rate of taxation under the HST regime? As a general rule, both goods and services are subject to the 13 per cent HST. However, the legislation contains many exceptions to the general rule. The Ministry of Finance has published a guide to help businesses and individuals appreciate the differences. No. Although the provincial sales tax for many goods and services has, in effect, been rolled into the HST, the Ministry of Finance has retained the PST on some items, such as an eight per cent provincial sales tax on insurance premiums. Is HST payable on premiums for my required insurance under the primary LSO program? No. Premiums for your professional liability insurance under the primary LSO program only attract the eight per cent PST. 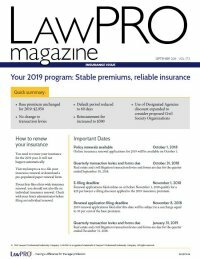 Is HST payable on premiums for my LAW FIRM’S Optional Excess insurance policy with LAWPRO? No. Premiums for your LAW FIRM’S Optional Excess insurance only attracts the eight per cent PST. How does the HST impact the amount I must remit to LAWPRO for the transaction levy surcharge? The transaction levy surcharge remitted to LAWPRO is considered to be an insurance premium, and as such, does not attract the HST. Does the HST have an impact on CLAIMS reported after July 1, 2010? The HST applies to many defence and investigative costs, such as legal fees, fees for expert witnesses and other services. However, the maximum amount that you are obligated to pay in relation to your DEDUCTIBLE or that LAWPRO is obligated to pay under the POLICY remains unchanged. What is the expected impact of the introduction of the HST on current and future CLAIMS? As at December 31, 2009, LAWPRO accrued an additional $10.7 million in loss reserves to cover the expected impact of the HST on CLAIMS for which notice was already received that remain open after July 1, 2010. In other words, the additional cost to the primary LSO program to cover HST that will apply to many defence and investigative costs on CLAIMS not yet resolved is close to $11 million. In addition, going forward, we expect the HST to add about $3 million annually to CLAIMS costs for which notice is received under each new POLICY year. Is there anywhere I can get additional information on the HST? Yes. In addition to your tax adviser, both the Ministry of Finance and the Canada Revenue Agency (CRA) have published materials on their respective websites (see below).